The price is right & now it’s filled with tulips! I bought these for friends who love having cut flowers in their homes. All who received them were very happy and assured me that they would be put to good use. I didn't keep any. I gave them as Christmas gifts, especially to people who have children because I thought it was a really neat idea for those who have a lot of kids to have a vase that won't break but yet can display beautiful flowers. I haven't heard back from anyone that I gave them to. 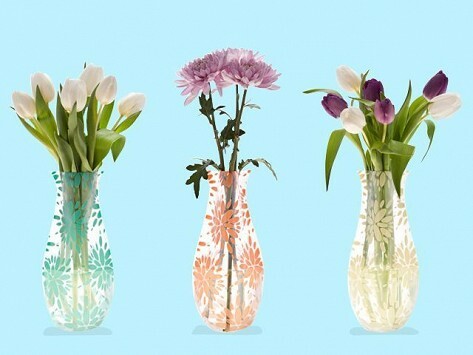 These Modgy vase are fun to use AND are safe for flowers taken to a patient at a hospital. No glass ! I bought several of these and gave two away for Christmas gifts and they were a hit. Clever idea especially when one has very little extra space for storage. I live in a hi-rise condo where space is paramount so mine will take up no storage space. I think I am going to have to order more of these. They don't hold very many flowers though but I can understand why but they are perfect for small spaces. Unusual product that has wide variety of prints and is reasonably priced. Fun, because you want to see for yourself that it really stands up. It came quickly and is actually larger than one expects. Good purchase!